Do you guys know about Gary? Gary is the snail with a broken-ish shell that I found in the alley, a year or so ago. Jake insisted on saving him and giving him a home in a christmas gladware container. Gary ate baby spinach, drank water, and travelled around that gladware. P.S. 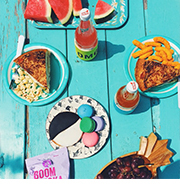 The picture below features Pink Himalayan Sea Salt. It’s the valentine of salt. When the weather warmed up Jake set him free in the giant shrub taking over my (old) backyard. It seemed like the dream home for a snail who’s shell healed. 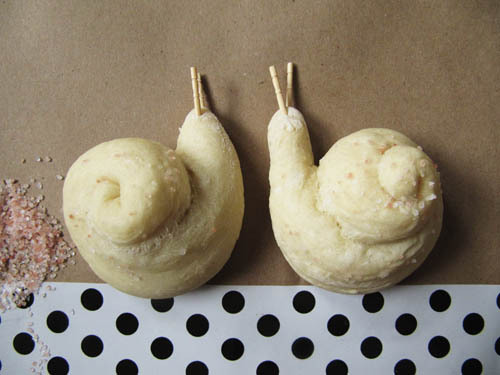 Now snails make me smile, and so, of course, I had to make this bread. And these little teeny snails are tasty and the size of a dinner roll cookie. (Does that make sense?) You can even use your favorite basic yeast bread dough for these. 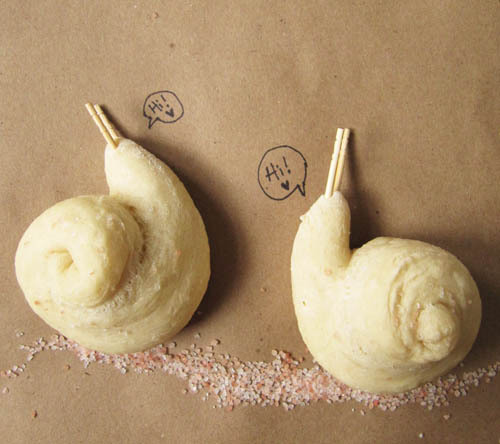 Basically, rolls shaped like snails are just the most fun. 48 extra thin carrot sticks, about 1-inch long, or toothpicks! In a small bowl, dissolve yeast and honey in 1/4 cup water. Let stand until bubbly, about 5 minutes. In a large bowl, mix flour, 1 cup of water, yeast mixture, a pinch of salt and olive oil. 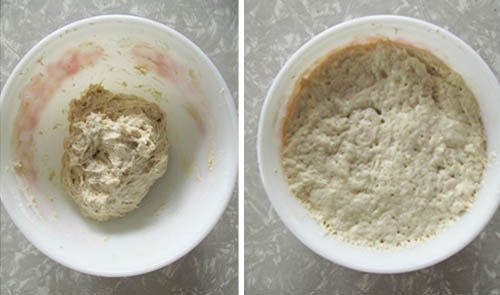 Mix well until it becomes a smooth dough. Cover with plastic wrap and let rise for 2 hours. Knead the dough and cut into 24 equal pieces. Roll each piece into a long rope. 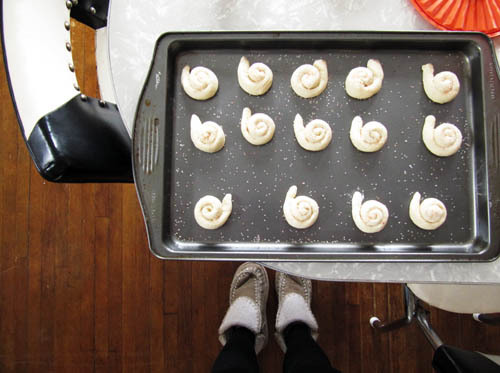 Roll up in a snail shape and transfer to a baking sheet. Brush with a little bit of water and sprinkle with sea salt*. Bake at 390°F until golden, about 9 minutes. Cool on a wire rack. 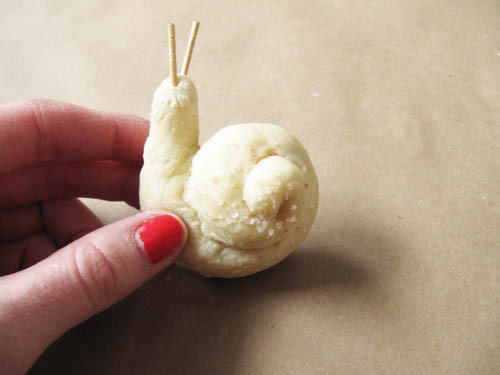 Make two small holes on the head of the snail and add the carrot sticks as antennas. * Only salt the snails that you’re going to be eating immediately. 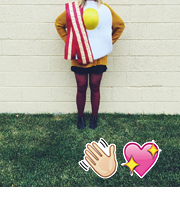 Salted goodness gets weird over night. The bread will get soggy and sad. 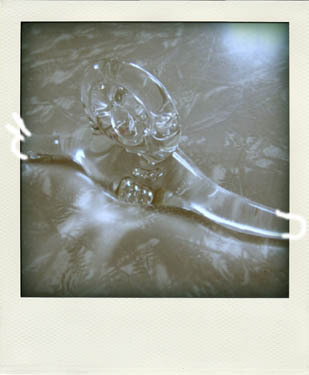 A glass snail that usually lives atop the tv. 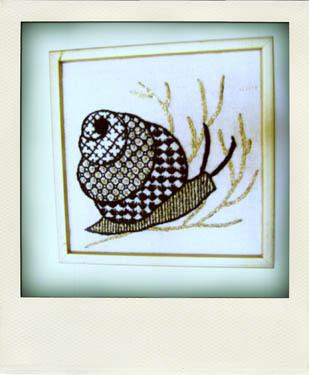 An embroidered snail that’s black and (bling, bling) gold. Both snail treasures are from Scout. My most FAVORITE boutique. Gary was a good snail… probably would’ve tasted good sauteed with shallots and baby bellas in butter with a squeeze of lemon… he will be missed. 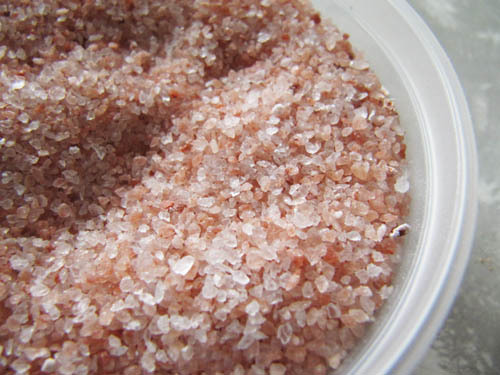 I also agree that the pink Himalayan sea salt is wonderful! It’s got such a great texture and color. I want to get a block of it with one of those salt microplanes. Fancy! Thanks Beckie! Snails are pretty cute. Jake thought I was trying to bully Gary out of the house because I left his French cookbook open to the escargot recipe! And if you got that awesome saltness, you’d have to wear the fanciest pants, for sure! Sounds awesome though. Tooooo cute..and tasty looking for sure!